Do you want your lift to feel less like a lift? Do you feel traditional lifts are too confining, depressing or uninspiring? Give your passengers the sense of freedom they desire with a scenic passenger lift from Hydrax, and make your lift into the best place you’ve been all day. 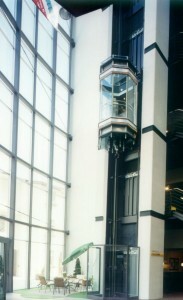 Scenic lifts supplied by Hydrax have all the features you would expect from a passenger lift. Precision engineering and hydraulic design ensure a smooth ride for passengers and peace of mind for you and your company. As with our Goods/Passenger lifts, Hydrax presents a variety of fittings, furnishings, button panels, lighting systems, and everything else to make your lift feel at home in your building, and help people feel at home in your lift. As well as standard installations, Hydrax designs and manufactures individual solutions for individual situations. Hydrax will make the lift suit your specific requirements, such as a free-standing structure, or fitting to an existing lift shaft. Hydrax have the solution.